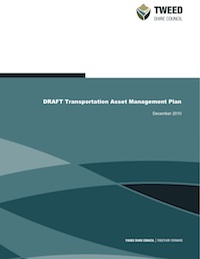 The Tweed Shire Council – Transportation Asset Management Plan (DRAFT) is available here. The Tweed Shire Council TAMP presents the scope of assets covered in the plan and a transportation asset hierarchy to prioritize asset classes based on agency objectives and customer expectations. The TAMP also presents system quality, accessibility, customer satisfaction, and responsiveness as council priorities, describing performance measurements, targets, and agency actions to address each objective. The TAMP addresses levels of service, current practices, demand management, lifecycle management, risk management, a financial summary, asset management practices, and a TAMP improvement plan. This document includes the following sections: Asset Valuation, Communications and Reporting, Current Methods and Tools, Data Management, Financial Plan, Future Demand, Introduction, Inventory and Condition, Investment Strategies, Levels of Service, Lifecycle Management, Objectives and Measures, Process Improvements, Regulatory and Legislative Requirements, Risk Management. • References customer surveys/outreach for establishing LOS statements.